With September in sight, a new school year is on the horizon. Soon, you’ll get to reconnect with friends you haven’t seen in a couple months. You’ll probably have the chance to make some new connections too! With that in mind, it’s a good idea to start brushing up on your conversation skills. 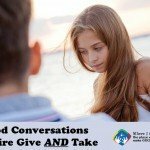 You’re Not Listening: Conversations require give and take. You can’t get to know a person if you aren’t paying attention to their point of view, or listening to their stories. Tuning a friend out while he/she is talking will make you look rude. You might hurt your friends’ feelings. Plus, you’ll miss out on a chance to learn about your friend, and discover more common ground. So look your friends in the eye when they are talking. Don’t talk over them. Do ask questions. And try not to change the subject as soon as they’re done talking. Listening closely may take some effort, but it will do you a major favor when it comes to your social life! You’re Repeating Yourself: A conversation that goes in circles is boring to most people. You may be passionate about a certain topic, but it’s important to remember that not everyone shares your interest. This doesn’t mean you should hide your passions. But you should be willing to talk about other things, when the conversation begins to shift. Keep in mind that conversations often flow through a variety of topics. If you keep redirecting it back to the same place, your friends will start to lose interest. 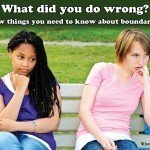 You’re Ignoring Boundaries: It’s extremely important to be aware of boundaries, especially when you’re getting to know someone new. 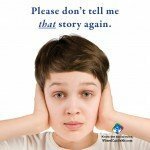 It’s a good idea to avoid personal questions, and controversial subjects, until you know your friend is comfortable with these discussions. Your friend may not tell you directly that you’ve crossed a line, but there are still signs to watch out for. For example, you might notice that when you ask about your friend’s dating life, she dodges your questions, breaks eye contact, or tries to change the subject. These are major clues that she is uncomfortable. Don’t push the subject. That will only make things awkward. Instead, allow your friend to steer the conversation to more comfortable territory. You’re More Interested in your Phone: For most people, phones are a key part of everyday life. 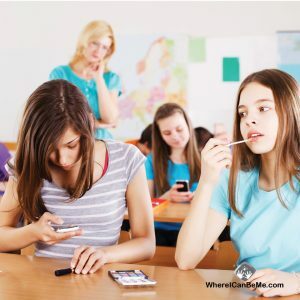 It’s easy to get absorbed in texts, games, and Instragram posts. But staring at a screen is a quick way to kill a conversation. It can make you seem bored, or disinterested in what’s begin said. That could hurt your friends’ feelings, and bring the conversation to a screeching halt. Sometimes, we play with our phones simply because we’re nervous. It can be easier to look at a screen, than to look someone in the eyes. Unfortunately, your friends can’t read your mind, so they may still be offended. Gather your courage, and put the phone away! It might be hard to break the habit, but it’s an important step for making your conversations better, and more meaningful. Starting conversations can always be intimidating, even if you know what to avoid. Still, it’s a key part of building strong friendships. So don’t be afraid to start chatting with someone new, who might become a friend. Don’t hesitate to revisit connections with friends you haven’t seen in a while. The new school year will give you tons of chances to build new relationships. As long as you avoid the major conversation pitfalls, you should be able to give your social life a major boost this fall!